Home Promos Contests Fight for the galaxy with the Sony PlayStation 4 Battlefront 2 Bundles! The force is strong with this bundle! A new year means a fresh start. Leave the past behind as you start the new year in a galaxy far, far away. Return to the Star Wars universe with the PlayStation 4 Battlefront 2 Bundles! First up is the Star Wars Battlefront 2 PlayStation 4 Bundle. This hardy bundle contains a Playstation 4 with 1TB storage, a wireless DualShock 4 controller and a physical copy of Star Wars Battlefront 2. Still don’t have a console? This bundle gets you right in the action with the hit console of this generation. If you ever thought of fighting as a Stormtrooper or a Rebel Commando across the galaxy then this is the bundle for you! The bundle’s SRP is 299.99 USD. But that’s not the only bundle available! You can also get the badass Limited Edition Star Wars Battlefront 2 PlayStation 4 Pro Bundle! This bundle contains a customized PlayStation 4 Pro with matching DualShock 4 custom controller and a physical copy of the Star Wars Battlefront II: Elite Trooper Deluxe Edition. 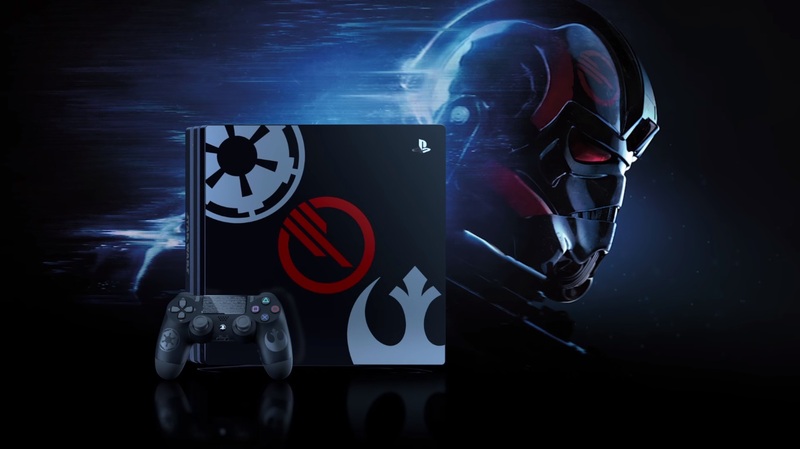 Emblazoned with the not only the emblems of the First Order and the Rebellion, the Limited Edition PlayStation 4 Pro features the logo of the Inferno Squad, the Imperial heroes of the Battlefront 2 campaign. If you want to show your love for the Star Wars franchise then do it by getting the Limited Edition bundle! This beast of a bundle is available with an SRP of 499.99 USD. Yes, the force is indeed strong with these bundles BUT if you just want to own a PS4 (like ANY PS4) so you can get your console gaming on, then BE SURE TO JOIN THE 2017 UNGEEK HOLIDAY GEEK GIFT GIVEAWAY! We’re giving away a lot of prizes with our grand prize being an NBA 2K18 PS4 bundle! Be sure to JOIN RIGHT NOW because our promo ends today (January 5, 2018 PH Time). Goodluck and may the force be with you!